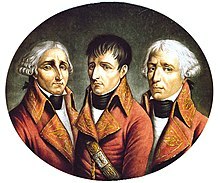 Prima Respublica Francica, officialis Respublica Francica (Francogallice: République Française) 21 Septembris 1792 proclamata fuit, per Res Novas Francicas. Conventio Nationalis: 1792-1795, inter hoc tempus fuit Terroris Regimen. Doyle, William. The Oxford History of the French Revolution. Secunda editio. Oxoniae: Oxford University Press, 2003. Pichot-Bravard, Philippe. La révolution française. Versaliis: Via Romana, 2014.